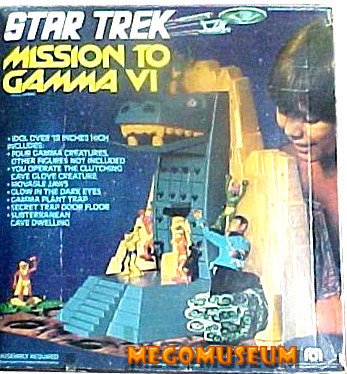 The Mission to Gamma VI Playset is really kind of a marvel. 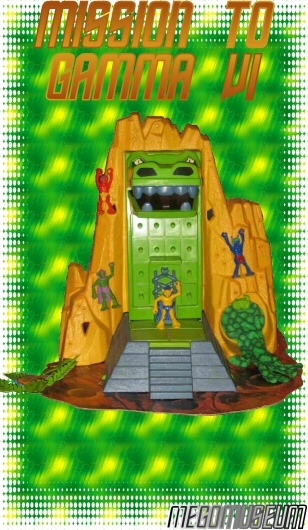 The large godlike idol has glowing eyes and movable jaws to munch on crew members or the little plastic alien creatures that come with the playset. The aliens are similiar to the old “Barrel of Monkeys” game, in that they link together. There is a slight resemblence to an Andorian in one of the Aliens but it’s doubtful that was intentional. 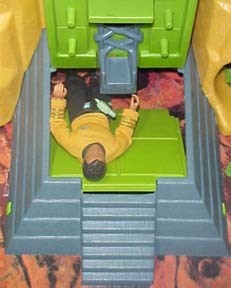 The Mego Gamma Six Aliens are as generic as they come. 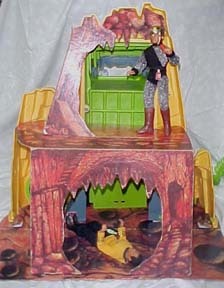 Mego answered all the questions unanswered by the episode “The Apple” by giving you a tour of Vols basement. Here is a more detailed shot of the background and exactly how the trap door mechanism works. You know, this is a pretty cool thing. Real hard and pricey to find, so I hope this hasn’t made you salivate too much.